Happy to support the Macks' any way I can. It's the least we can do after all they do for us...and we can win some cool sets! Merry Christmas. I'm looking for a Christmas miracle here. Anything would be appreciated. Purchased my tickets, love supporting this cause. My kids have gone to a similar school here in Orlando so I understand the value of such a program. Hope they reach their goal for January. Like I have said before and will say again, St. Paul School is worth the fight and we appreciate all the support. If more active members would buy one just $10.00 raffle ticket, we could make a huge dent in the deficit. Wouldn't knowing that skew everything? 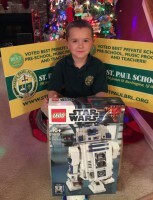 Thank you all for supporting the Keep St. Paul Strong - Lego Raffle! Our son is only 3-years old and attends St. Paul School. He can now write his numbers and color in the lines! Everyday we witness his growth and it is amazing. We attribute his successes in no small part to his strong teachers and the small class size at St. Paul's. Our family would sorely miss the school if we can not raise the money this year. Thanks again for the support. We don't know what tickets people buy and your chances are pretty good regardless. We will be adding a few more sets tomorrow. Yes, my son is in the Kindergarten class and is already leaps and bounds ahead of other surrounding school systems from discussions with neighbors. Hey Ed! --- This raffle is wonderful and will perform miracles---- with the help of social media ! St. Paul School is truly a blessing and a wonderful place for children to grow and learn. I have 4 children, ages 21, 18, 13 and 9. My 2 oldest have graduated from St. Paul School and my third child is currently in the 8th grade and set to graduate this year--in fact she is in the video that is posted on your blog!! My youngest is in 3rd grade and my husband is an alumni as well. We have strong roots in this school lol! I have seen many changes at St. Paul School ......as well as in the world since my oldest daughter's first day there. St. Paul offers safety and top notch education. The teachers here really care about how the students are doing academically as well as emotionally. These days that is so important to kids.....especially in middle school. Though they may have BiG attitudes, they are still children inside. Every day the kids, the parents, the teachers , the administration.... all have a chance to interact together. And more importantly .... all are welcome to do that. Not every school can say that. It takes a village to raise a child .... there is no better "village" than St. Paul School! My older girls have gone on to graduate from Notre Dame High School (Catholic High School) in Lawrenceville and both excelled in honors and AP classes. My oldest was inducted in the National Honor Society at the Collegiate level and currently has a degree in Biology. My second daughter is currently a freshman at Rowan University and majoring in Chemical Engineering. She has received an academic scholarship. My 8th grader is in the National Junior Honor Society and has participated and placed in many math and academic competitions. She will take the SAT and the ACT in the spring as a "warm-up" before high school. My youngest is in 3rd grade but can write in cursive (have a signature! ), read at a much higher level and is halfway learning division. I can see a combo prize was added, the 10211 Grand Emporium and 10234 Parisian Restaurant. Great deal. Maybe more people will get off their butts and help out. ATTENTION: NEW PRIZE(s) ADDED TO ST. PAUL SCHOOL RAFFLE: A dynamic duo...The 10234 Parisian Restaurant and the 10211 Grand Emporium as a combo package!!! Yes, a very nice member, Red Baron, stopped by yesterday and donated a 10234 Parisian Restaurant yesterday. He has some pictures to post. I threw in a 10211 Grand Emporium and that is another top notch prize. Thanks Red Baron for helping with this good cause. Edited December 28, 2015 by Roy vd M.
Bought a couple of tickets for the raffle to support St. Paul. And don't worry guys, I never win anything. In for two more tickets - t'is the season for giving. In for three of the raffles. Thanks for all that you do for us Ed and Jeff! Good luck everyone! Back in for a ticket for the new Bundle too. I love a raffle, even more so when it's for such a good cause!